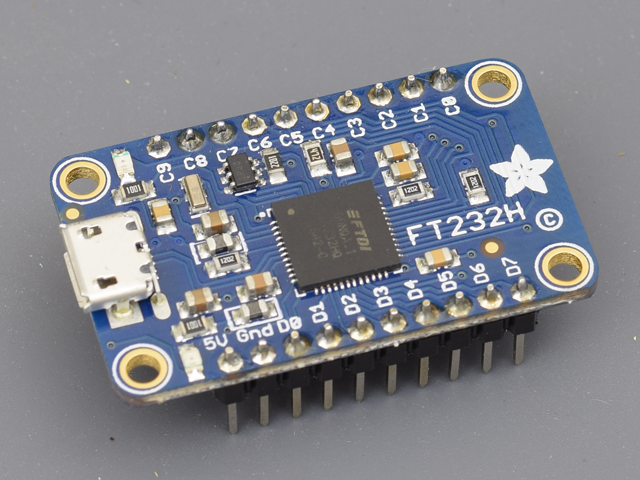 The FT232 USB-to-serial converter is one of the most commonly-used methods of adding USB functionality to small projects, but recently I found that these chips are capable of sending more than just serial signals. With some creative programming, individual output pins can be big-banged to emulate a clock, data, and chip select line to control SPI devices. This post shares some of the techniques I use to bit-bang SPI with FTDI devices, and some of the perks (and quirks) of using FTDI chips to bit-bang data from a USB port. Code examples are available on GitHub, and links to additional resources are at the bottom of this post. After the final build I created a slightly more polished “ftdiDDS.exe” program to control an AD9850 frequency synthesizer from the command line by bit-banging a FT-232, and code (and binaries) are also available on GitHub. The goal of this post is not to describe every detail about how to control FTDI chips. Instead, the key points of the software are described here (and in the video) so you can get the gist of the main concepts. If you’re interested in additional detail, full code examples are provided on the GitHub folder for this project. All code examples were tested with Visual Studio Community 2017, are written in C#, and uses the FTD2XX_NET library installed with NuGet. Also, see the list of resources (including official FTDI datasheets and application notes) at the bottom of this post. This block of code attaches to FTDI device 0 (the first FTDI device it sees) and sends the letter “a” using a traditional serial protocol. Since this code connects to the first FTDI device it finds, this could be a problem if you have more than 1 FTDI device attached. Alternatively you could have your program connect to a specific FTDI device (e.g., by its serial number). To see what FTDI devices are attached to your computer (and see or set their serial numbers), use the FT_Prog application provided by FTDI. 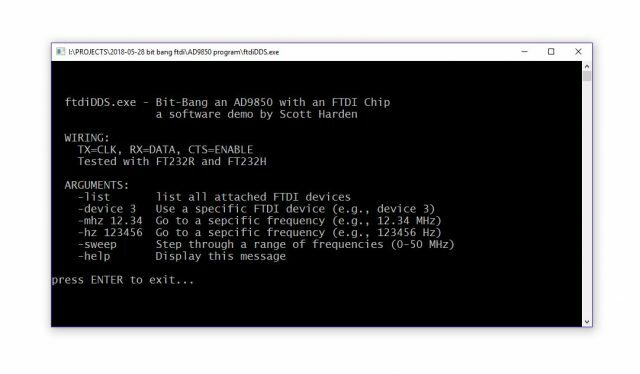 Also, see the code I use to list FTDI devices from inside a C# program ftdiDDS program. Here is a minimal complexity LED blink example. This code block alternates between writing 0 (all pins off) and 1 (TX pin high) over and over forever. Note that ftdi.SetBitMode is what frees the FTDI chip from sending serial data when ftdi.Write() gets called. The 255 is a byte mask which tells all 8 pins to be outputs (by setting all 8 bits in the byte to 1, hence 255). Setting bit mode to 1 means we are using asynchronous bit bang bode (sufficient if we don’t intend to read any pin states). For full details about these (and other) bit-bang settings, check out the Bit Bang Modes for the FT232R application note. In reality all we want to send to SPI devices are a series of numbers which we can place in a byte array. These numbers are transmitted by pulling-low a clip select/enable line, setting a data line (high or low, one bit at a time) and sliding the clock line from low to high. At a high level we want a function to just take a byte array and bit-bang all the necessary SPI signals. At a low level, we need to set the state for every clock cycle, bit by bit, in every byte of the array. For simplify, I use a List<byte> object to collect all my pin states. Then I convert it to an array right before sending it with ftdi.Write(). The AD9850 is a SPI-controlled DDS (Direct Digital Synthesizer) capable of generating sine waves up to 65 MHz and is available on breakout boards for around $20 on eBay and Amazon. It can be programmed with SPI by sending 40 bits (5 bytes), with the first 4 bytes being a frequency code (LSB first) and the last byte controls phase. To calculate the code required for a specific frequency, multiply your frequency by 4,294,967,296 (2^32 – 1) then divide that number by the clock frequency (125,000,000). Using this formula, the code for 10 MHz is the integer 343,597,383. In binary it’s 10100011110101110000101000111, and since it has to be shifted in LSB first (with a total of 40 bits) that means we would send 11100010100001110101111000101000 followed by the control byte which can be all zeros. In C# using the functions we made above, this looks like the following. If somebody wants to get fancy and create a quadrature sine wave synthesizer, one could do so with two AD9850 boards if they shared the same 125 MHz clock. The two crystals could be programmed to the same frequency, but separated in phase by 90º. 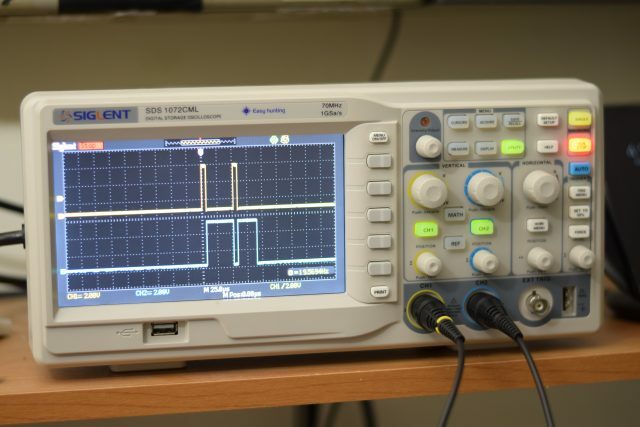 This could be used for quadrature encoding/decoding of single sideband (SSB) radio signals. 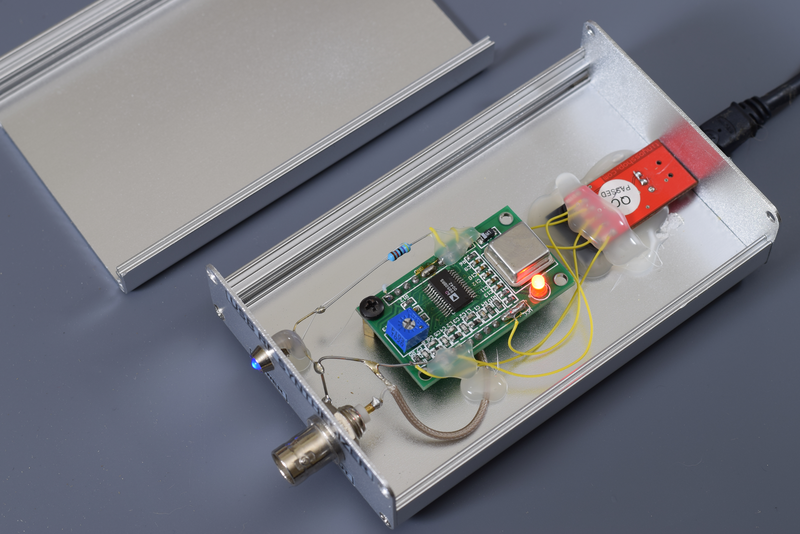 This method may be used to build a direct conversion radio receiver ideal for receiving CW signals while eliminating the undesired sideband. This technique is described here, here, and here. Rather than hard-coding a frequency into the code, I allowed it to accept this information from command line arguments. I did the same for FTDI devices, allowing the program to scan/list all devices connected to the system. Now you can command a particular frequency right from the command line. I didn’t add additional arguments to control frequency sweep or phase control functionality, but it would be very straightforward if I ever decided to. I called this program “ftdiDDS.exe” and it is tested/working with the FT-232R and FT-232H, and likely supports other FTDI chips as well. 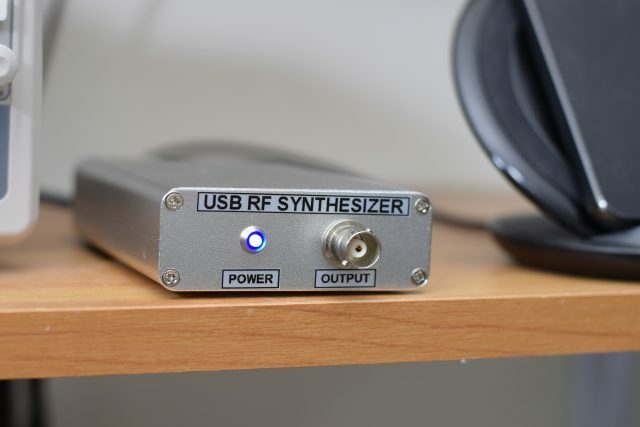 Although my initial goal for this project was simply to figure out how to bit-bang FTDI pins (the AD9850 was a SPI device I just wanted to test the concept on), now that I have a command-line-controlled RF synthesizer I feel like it’s worth keeping! I threw it into an enclosure using my standard methods. I have to admit, the final build looks really nice. I’m still amused how simple it is. There is a serious problem with the FT-232R that affects its bit-bang functionality, and it isn’t mentioned in the datasheet. I didn’t know about this problem, and it set me back years! I tried bit-banging a FT-232R several years ago and concluded it just didn’t work because the signal looked so bad. This week I learned it’s just a bug (present in every FT-232R) that almost nobody talks about! 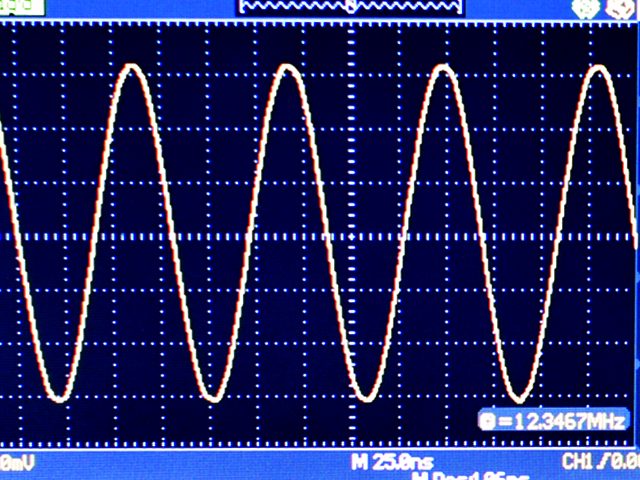 The best way to demonstrate how “bad” the phase problem is when bit-banging the FT232R is seen when trying to send 50% duty square waves. In the photograph of my oscilloscope below, the yellow trace is supposed to be a “square wave with 50% duty” (ha!) 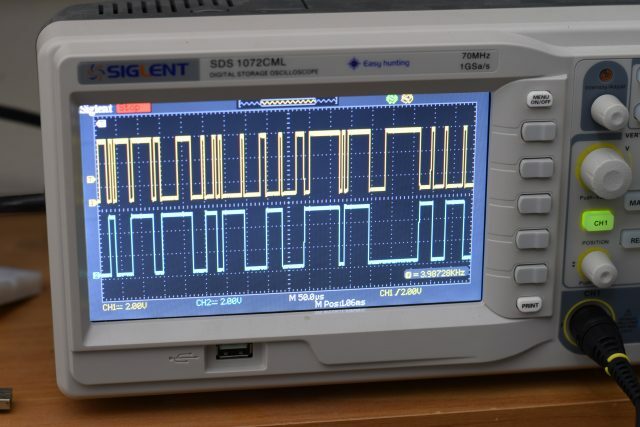 and the lower trace is supposed to be a 50% duty square wave with half the frequency of the top (essentially what the output of the top trace would be if it were run through a flip-flop). The variability in pulse width is so crazy that initially I mistook this as 9600 baud serial data! Although the timing looks wacky, the actual shifts are technically correct, and the FT-232R can still be used to bit-bang SPI. Unfortunately this unexpected behavior is not documented in the datasheet, but it is referenced in section 3.1.2 of the TN_120 FT232R Errate Technical Note where it says “The output may be clocked out at different speeds … and can result in the pulse widths varying unexpectedly on the output.” Their suggested solution (I’ll let you read it yourself) is a bit comical. It’s essentially says “to get a 50% duty square wave, send a 0 a bunch of times then a 1 the same number of times”. I actually tried this, and it is only square-like when you send each state about 1000 times. The data gets shifted out 1000 times slower, but if you’re in a pinch (demanding squarer waves and don’t mind the decreased speed) I guess it could work. Alternatively, just use an FT-232H. Update (2018-10-05): YouTube user Frederic Torres said this issue goes away when externally clocking the FT232R chip. It’s not easy to do on the breakout boards, but if you’re spinning your own PCB it’s an option to try! Bit-banging pin states on FTDI chips is a cool hack, but it isn’t necessarily the best solution for every problem. This section lists some alternative methods which may achieve similar goals, and touches on some of their pros and cons. LibFTDI – an alternative, open-source, third party driver for FTDI devices. Using this driver instead of the default FTDI driver gives you options to more powerful commands to interact with FTDI chips. One interesting option is the simple ability to interact with the chip from Python with pyLibFTDI. Raspberry PI can bit-bang SPI – While perhaps not ideal for making small USB devices to send to clients, if your primary goal is just to control a SPI device from a computer then definitely consider using a Raspberry Pi! A few of the pins on its header are capable of SPI and can even be driven directly from the bash console. I’ve used this technique to generate analog voltages from a command line using a Raspberry PI to send SPI commands to a MCP4921 12-bit DAC. Multi-Protocol Synchronous Serial Engine (MPSSE) – Some FTDI chips support MPSSE, which can send SPI (or I2C or other) protocols without you having to worry about bit-banging pins. I chose not to pursue this option because I wanted to use my FT232R (one of the most common and inexpensive FTDI chips), which doesn’t support MPSSE. ALthough I do have a FT232H which does support MPSSE (example project), I chose not to use that feature for this project, favoring a single code/program to control all FTDI devices. Bus Pirate – If you don’t have a Bus Pirate already, get one! It’s one of the most convenient ways to get a new peripheral up and running. 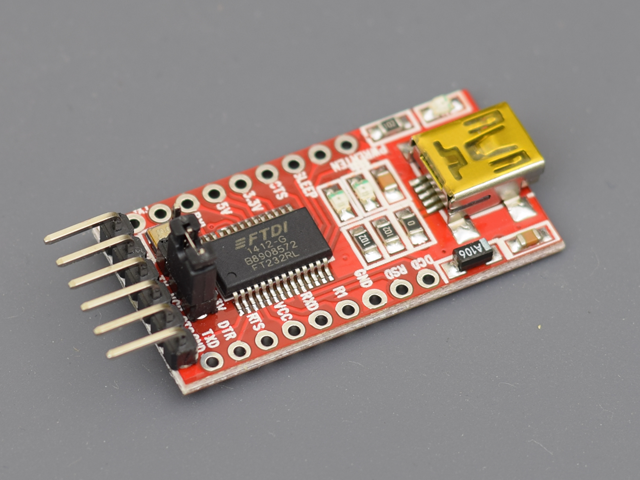 It’s a USB device you can interact with through a serial terminal (supplied using a FTDI usb-to-serial converter, go fig) and you can tell it to send/receive commands to SPI or I2C devices. It does a lot more, and is worth checking out. 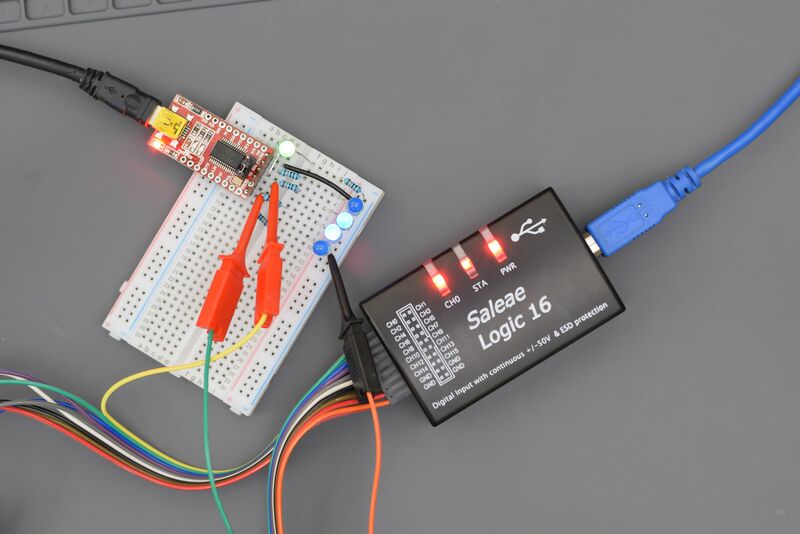 Saleae logic analyzers – The official Saleae hardware (not what was shown in my video, which was a cheap eBay knock-off) can do a lot of great things. Their free software is really simple to use, and they haven’t gone out of their way to block the use of third-party logic analyzers with their free software. If you are in a place where you can afford to support this company financially, I suggest browsing their products and purchasing their official hardware. DYMO Letra-Tag LT100-H label maker and clear tape – When labels are printed with black boxes around them (a tip I learned from Onno) they look fantastic when placed on project boxes! Don’t buy the knock-off clear labels, as they aren’t truly clear. The clear tape you need to purchase has the brand name “DYMO” written on the tape dispenser. FT232H breakout board (adafruit) – This is where I got the FT232H board used in this video. You can find additional similar FT232H breakout boards on Amazon. 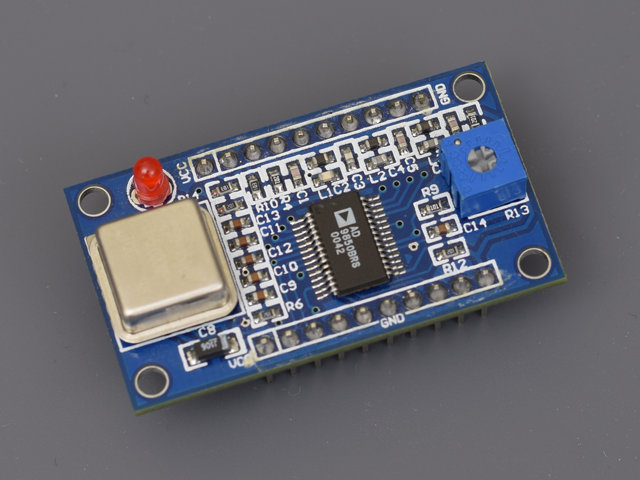 FT232R breakout board – Everyone sells these. I got some lately on Amazon, but I’ve gotten them before on eBay too. 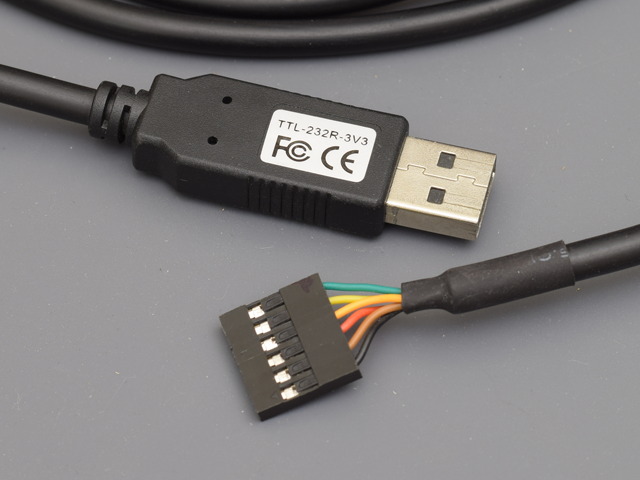 TTL-232R cable – If you’re making a device which you want to appear a bit more professional, this cable has the FT232R built-in and it just has several pins (in a female header) you can snap onto your board. Bit Bang Modes for the FT232R – FTDI datasheet detailing how to Bit-Bang the FT232R chip. In practice, the terms, language, and code examples in this datasheet seem similar enough to the FT232H that it probably is all you need to get started, since it’s the large-scale concepts which are most important. FT232R BitBang SPI example – This code uses libftdi, not the default driver supplied by FTDI (libftd2xx). FT232R BitBang mode is broken – an article from 2012 detailing how bad the timing is when bit-banging pin states on the FT232R. Bit-banging pin states on FTDI devices is relatively simple, even using the standard drivers and API. The FTD2XX_NET library on NuGet provides a simple way to do this. The output of the FT232H is much more accurate in the time domain than the FT232R. Although there are crazy timing issues with the FT232R, it works fine when driving most SPI devices. Here we used this technique to write a console application to control an AD9850 DDS directly from an FT232R using command line arguments. When given a formal enclosure, this project looks (and works) great! 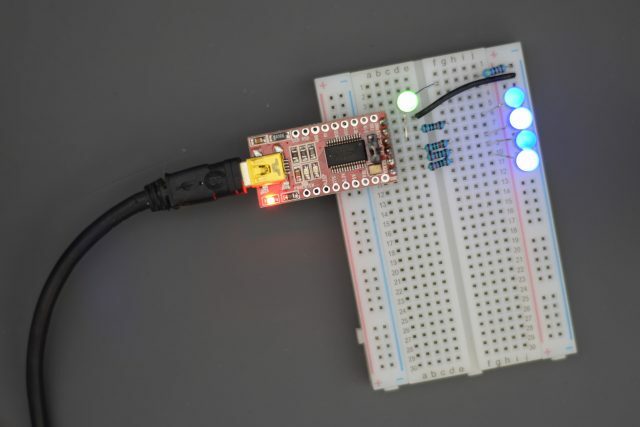 If you make something cool by bit-banging a FTDI device, let me know about it!